Heavy thunderstorms and lightnings were detected on the 21rst of June by Sat24 over the ca. 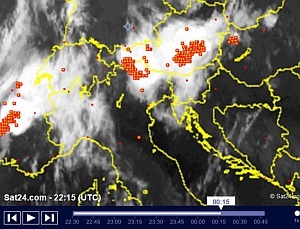 260 km distanced region of Trento in Italia. 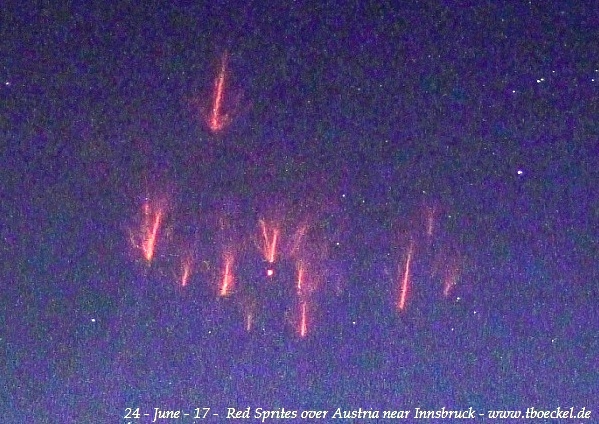 The appearance of a Red Sprites takes less than 2/100 seconds, and could be very bright and be seen with the naked eye. However, the brightness is several times under a lightning discharge. 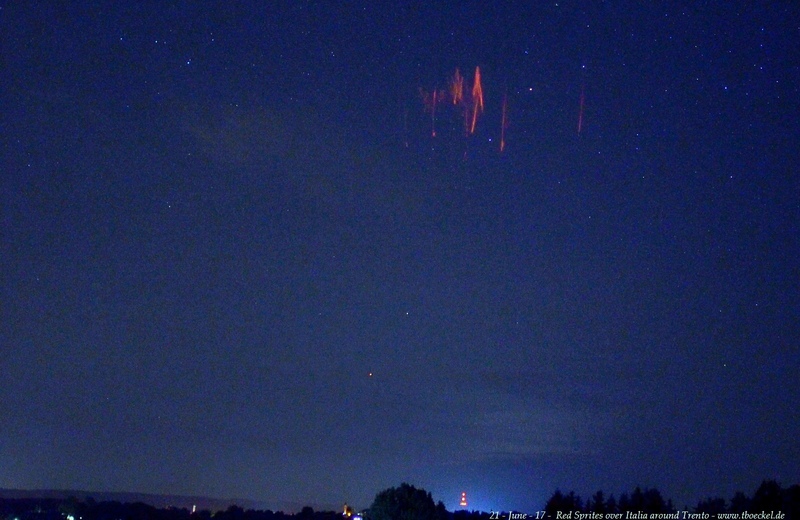 'Red Sprites' can appear on an average altitude of 60-80 km in the mesosphere. 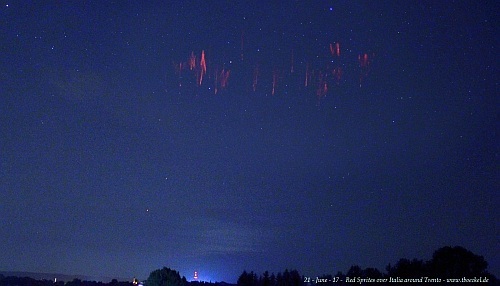 Also sightings to a height of 90 km to the edge of the ionosphere are possible. The height of the sprite can vary from 10 km to 20 km. The width of the discharge can reach up from 40 to 60 km. 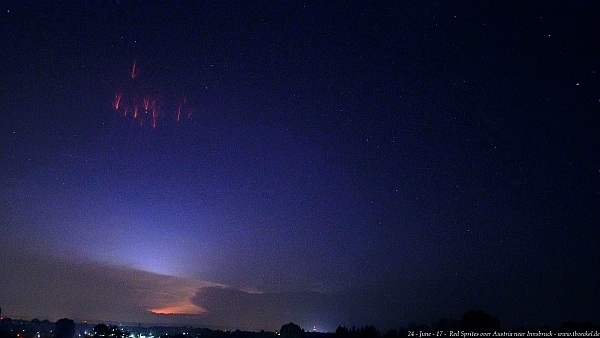 But how does the rare luminous phenomena come to this name, when they were discovered and what is the reason of origin? Until 1989, the existence of Red Sprites was generally denied because only jet pilots announced sporadic sightings. Here they reaped rather grumpy and sarcastic reactions :-(. Thus, many sightings have been omitted. 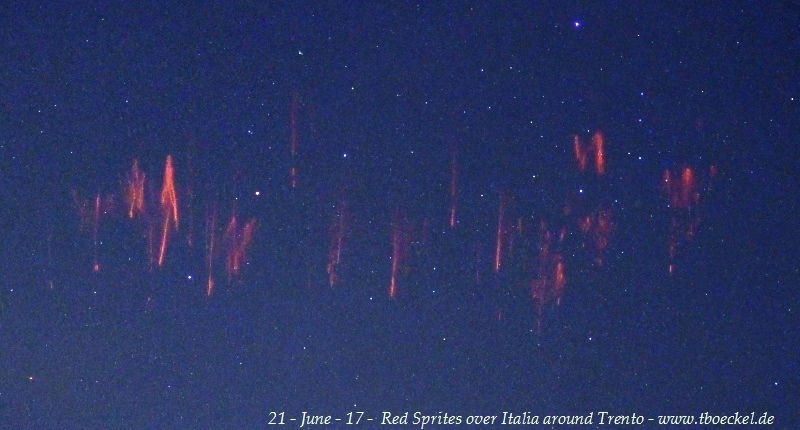 1989 the first Red Sprite photos did succeed, but due to the not yet advanced camera technology the results were scientifically useless. 1991 the astronauts of the former Space shuttle mission succeeded photographically to capture this phenomenon specifically the first time from space. These photos served as the first meaningful evidence. Afterwards high-tech peppered research aircrafts were inserted by very costly experiments from the NASA and NOAA, which should explain and analyze these phenomena further. After this efforts yielded no results for months, and the researchers literally get messed around with this situation, the called these discharges almost mischievously 'Sprites'. 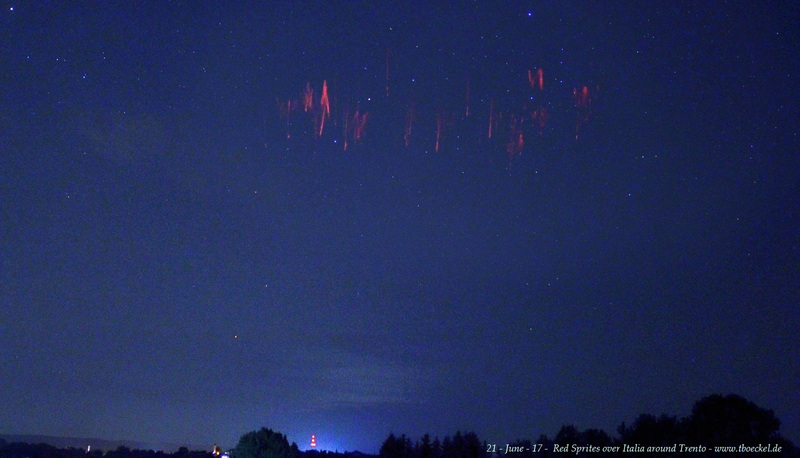 Incidentally, we don’t have a plausible explanation of the origin of Red Sprites until today, but there are countless theories. Look out for the scientific article in the Washington post. The most common version declares that during heavy thunderstorms larger areas of electrical tension build itself up over the super cells, which consequently discharge due to the oversaturation by itself. The actual luminous phenomenon gets produced in the mesosphere by collision of electrons with the always present cosmic gamma radiation.